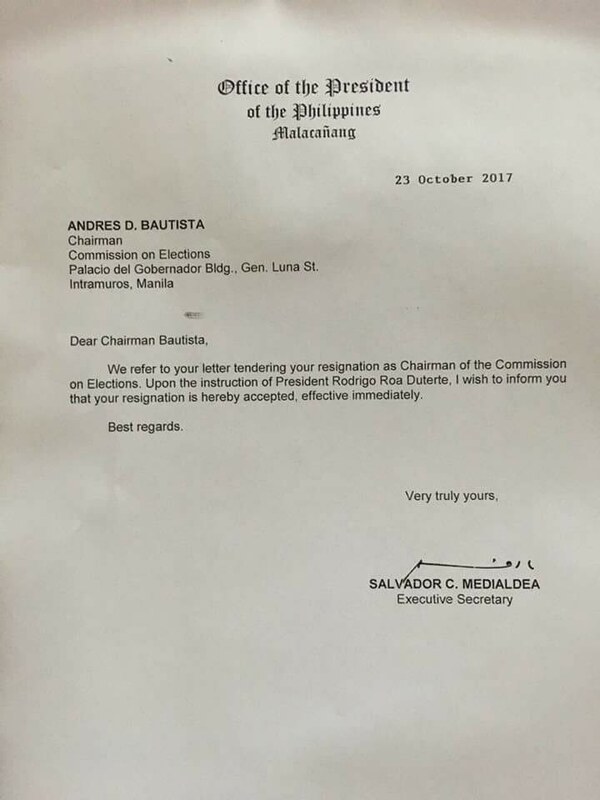 In a letter that was released Monday evening, Malacanang has officially informed Commission on Elections Chairman Andres Bautista that President Rodrigo Duterte has accepted the former's resignation from his post. Bautista, who was accused of amassing ill-gotten wealth and accepting money from election contractors, was earlier impeached by the Philippine legislature. We refer to your letter tendering your resignation as Chairmn of the Commission on Elections. Upon the instruction of President Rodrigo Roa Duterte, I wish to inform you that your resignation is hereby accepted, effective immediately," the official cable from Malacanang penned by Executive Secretary Salvador Medialdea said.